So before I tell you all about this super fun new venture I am entering into I have to first take you back a few pages. You see, like most people in this world, I keep searching, praying and hoping that God will give me a passion in whatever endeavor I am taking on. When I was in college I had two summer internships. One in New York working for a public relations agency and another in Los Angeles working for the Los Angeles Film Festival as a Publicity Assistant. I was excited about these opportunities. I knew it would be a rush to be able to experience these big cities on my own but when it came time to graduate I still felt a bit anxious. The work I had done hadn't inspired me. I hadn't experienced a deep passion or drive for the work I was doing. Yes, I was an intern so thinking maybe that was the reason I wasn't psyched, I entered into my first job. I landed a position as a Marketing and Events Coordinator for a small non-profit organization that helped unite and lobby for the state of Arizona's tourism funding. I helped organize events to bring together all those affected by tourism in the great state of Arizona. Although it was more "fun" I still didn't feel I had found my calling. I went to one more job in Marketing for a high-end resort in Sedona. This really discouraged me. I didn't feel excited to go to work. I mean, don't get me wrong. Work is work, you don't always want to do it. I understand. But I really felt lost. That's when by the encouragement and support of my husband my tables began to turn. I had always had a passion for fitness and exercise and I wanted to feel as if I was contributing to peoples lives. Helping them in some way. That's when I became a Certified Personal Trainer and this really changed my outlook on life. I realized I could love what I did when it came to work. Once I got pregnant with my first child I knew my job description was about to change once again. I knew I wanted to stay home with my little ones and spend that precious time with them. Now having two children I once again love my job. I am constantly helping these little people and I am contributing to their lives by nurturing and teaching them what this life is about. Being a mom is enough. However, I kept asking God if there was more he had for me. Something I could find both therapeutic and challenging. That's where I am today. I got bibbed. I felt the strong desire to begin learning to sew. To use my creativity and design my own patterns for the little people in my life. That's where ELBE baby was created. Bringing my little hobby into a place to share my love through handmade goods. I feel as if God has given me such a gift in giving me a passion for sewing and making these one of a kind scarf bibs and other accessories. Yes, I am not the only one to start a little shop like this but I do feel like this little shop corner was paved just for me. I hope you will come peek at my new shop and perhaps allow me the privilege of making you and your little ones unique and functional accessories! You can find a million different registry checklists on the internet and so this may not feel too different but I hope to share what we really, truly use and have found functional in the first months of our little one's lives. These are the things I use on a daily basis and have thrown a lot of the non-practical stuff out of the window. I'm not trying to further promote consumerism because as a new parent it is so easy to get sucked in to wanting and thinking you need every little device and contraption for your sweet little bundle. Yes, carseat is essential. We have the Chicco KeyFit 30 and love it. Yes, somewhere to sleep but I'm not gonna sit here and tell you about our crib and the organic bamboo mattress pad or bassinet we use because when they are so little they will most likely be sleeping on you 80% or more of the time. Yes, a stroller has been a life-changer for us. We've used the Chicco KeyFit Caddy stroller when we had one baby and now the Baby Jogger City Select double stroller for two kiddos. These are the big ticket items that do matter. However, let me elaborate on some of the small, seemingly insignificant items that our family has found most useful. I won't go on and on about all the benefits of baby-wearing but there are SO many! Now, when you have your second or third child, its most beneficial because you simply need your hands free and one less crying child. 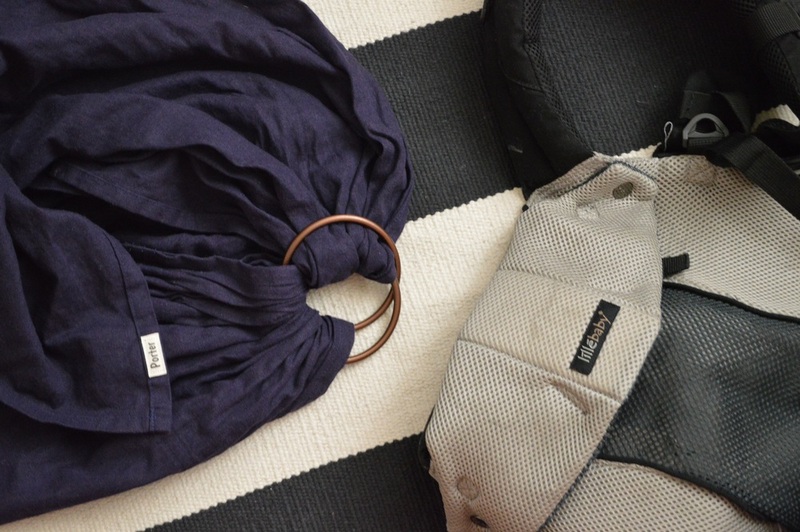 I have absolutely loved the ring sling baby carrier I purchased online from Porter Baby. Unfortunately, they no longer seem to be in business but fear not, there are so many other brands out there. Sakura Bloom is a well known and respected brand for instance. They can be on the pricer side so many companies have made very similar quality products in competition. The ring sling is easy to use, adjustable, light, durable and most importantly makes your baby feel a part of you once again. Ellie was in the sling all the time her first couple months when she was constantly sleeping and yet I needed to be hands free to take care of my son, Beau. I do strongly recommend this type of baby carrying device for those early months but they can be used for years to come with your kiddos. The Lillebaby is a terrific lightweight, ergonomically designed baby carrier. It has six different carrying options and tons of support for mom. The straps are nicely paded, the waist belt nearly takes all the weight off your back and the upper back straps clip together to keep your posture in check. This is by far the most comfortable way to baby carry in my opinion, even though it may not look the most fashionable. You can begin using this carrier when your little one hits 7lbs so for most, that's right away. It also comes with a removable sunshade that can also be used for privacy when nursing. For our family this type of baby carrier has been a game changer when it comes to traveling, grocery shopping, hiking and just getting things done around the house. It is a little less expensive than the well known Ergo brand and can be found on Amazon or at Buy Buy Baby where you can use a 20% off coupon! Ohhhh the Woombie! What a life-saver this has been for us with both our kids. I am a horrible swaddler when it came to those beautiful muslin blankets. So I found the Woombie to be the perfect product for us. Simply zip em up! I'd say the only draw back is our kids may have loved it too much. They have a few different sizes based on weight, lots of cute colors and patterns and can be found on Amazon. If you and your baby like them I would suggest getting two so that you can have one in the wash while using the other (let's face it, spit-up happens). Newborn clothes are adorable, 3-month clothes are adorable but the fact of the matter is my kiddos are in comfy, soft, warm pajama's 90% of the time. Carter's fleece pajama's are my favorite because their sizing always seems to be pretty accurate if you're baby is growing in the average range. The best part is they have lots of styles and they are very affordable. Costco is a great place to find these footed fleece pajamas in the cooler months or check out TJ Maxx, Ross or of course a Carter's store which always has online coupons for additional savings. I remember seeing this in Buy Buy Baby when I was registering for my first child and wondering what the heck the big deal is regarding this pricey sound machine. Well after trying a few different devices and then receiving this as a gift from my sister-in-law I realized quickly how great this thing is. Instead of it being digitally recorded white noise, it has its own built-in fan that creates the noise. Dohm truly fills the room with noise so that baby is both soothed and uninterrupted. I got super lucky and happened to find a second one at a garage sale but I would have gladly paid full price for this little guy. We even travel with him as part of the family. A dear personal training client of mine sent this to me as a baby gift when I had my son, Beau and boy, oh boy has this gotten some use! This product is fabulous for newborns and infants in those first 3 months or so. However, I will say, Beau, now 2 years old will still sit and look at books in the podster from time to time so it continues to get some good mileage. This thing is great to put on the couch next to you or you can put it on your bed in between you and your spouse as a great way to keep the baby close by at night but safely confined if you get nervous about co-sleeping. It has a slight incline which is nice if they have any reflux and it snuggles them in giving that swaddled feeling. Both of our kiddos took great naps and even nighttime sleep in this for several months and continues to serve as a great place to put baby down when needed. First of all let me tell those of you who may be expecting, check with your insurance company as to whether they will pay for a breast pump! We were able to get a hospital-grade Medela breastpump paid for by our insurance company. It's not included in every plan but it is definitely worth the phone call to find out. Now, if it is not included in your plan I would still recommend Medela. They are known to be the highest quality and I have had such a great experience I wouldn't try any others. I also own a Medela hand pump and it is fabulous as well. Couldn't believe how great it works although it will give you a forearm and grip workout. For me, having a pump was like having a lifeline to the outside world. If one of the grandparents or even my husband was willing to take the kiddos for a bit I was joyfully running to my pump to suction out the goods. On a different note, those first few days after your milk is coming in you may find yourself absolutely engorged and having a pump can save you a lot of misery. Fact of the matter is your little ones stomach is not large enough to drink everything you've got to offer those first couple days so pump what you need to give yourself a little comfort as your body regulates. If you are going back to work after maternity leave you can get on your pumping schedule right away to train your body from the get-go! I also want to include what bottles I have fallen in love with. I have used Dr. Brown's bottles from the start but now I am using the glass instead of plastic. Both are great but I feel more comfortable heating up the milk in the glass rather than heating up the plastic. In my mind every little bit helps. Best part about Dr. Browns is their patented 2-part internal vent system which eliminates air bubbles in the milk, which helps to reduce feeding problems like colic, spit-up, burping and gas. When it comes to nursing in public or when we have family or friends over I am still pretty modest and prefer to cover up so I have absolutely loved my Covered Goods nursing cover. It is made of a stretchy, jersey material that goes overhead and covers you 360 degrees so baby can't fling the cover off of you, exposing the goods. It is very light and breathable so you aren't feeling like you just put on a parka either. It also multi-purposes as a carseat and a grocery cart cover or even an infinity scarf for yourself. They have lots of beautiful patterns to choose from which makes it hard to decide on just one! I have experimented with a lot of different baby body washes from California Baby to Honest Company to Burt's Bees and I have been fine with all of them but when I received my Norwex baby wash clothes and hooded towel I fell in love. The towels are constructed out of the super-soft and extra-gentle Norwex antibacterial Microfiber. You can literally use these wash clothes and no soap at all and get those little ones squeaky clean without any chemicals to irritate their skin. The hooded towel is super warm, cozy and quick drying. If you've never heard of Norwex I have some friends who can hook you up! My good friend Christina introduced this one to me and it has been a life saver. Beau has never had a lot of diaper rashes but when he gets them we simply put a little of this cream on him and it's normally gone within the next day or two. You can find it at Walgreens or other drugstores in the urinary incontinence aisle or order it off the never failing Amazon. I am comparing this cream to the others we've tried which are Desitin, Burt's Bees Baby Bee Diaper Ointment and Honest Company's Organic Healing Balm. What a silly thing to include, right? Welp, we use these clippers more than you would expect! Those little nails grow SO fast and to save your baby from scratches you want to keep them nice and short. This brand specifically has been fabulous as I have yet to ever snip my kids skin which would probably be the end of me ever trimming my kids nails and they'd wind up in the circus for tentacle nails. We keep a pair of these trimmers in the car and in most rooms of the house. Hello, hello! I feel as if I've been away for WAY too long. I took the whole month of January off while coming off the holiday high and unintentionally from contracting what felt like the black plague in our house which has lasted for weeks. I wish I could tell you even now that we're 100% but we still have residual coughs and runny noses sounding around the house like an untuned brass band. Today I'd like to share a quick and helpful recipe for a breastmilk-supporting smoothie. I have mentioned this before in a previous blog post but have gotten a few personal messages asking for the ingredients so I felt it could stand as its own topic today. The ingredients are simple but all play a role in helping support your milk supply. When it comes to the main liquid portion of the smoothie you can use cow's milk which can be great for enriching your milk or you can use a non-dairy alternative if your little one doesn't seem to be handling dairy well. Such options include almond, soy or coconut milk. I personally have come to enjoy almond milk (and I can buy it in bulk at Costco) so that is typically what I use but occasionally if I'm out of my stash I use my husband's 2% milk. The other big players in the recipe are the flaxseed meal, Brewer's yeast and protein powder. Flaxseed and Brewer's yeast are known to boost your milk supply quantity. For many, you can noticeably tell the difference in your breasts whether you've had these ingredients that day or not. Protein powder is added because I know for myself, I struggle to get the needed amount of protein in my diet for both my body and to pass on to my little nugget. Gotta keep fueling that brain growth! Obviously this is a recipe that can be played with, altered, added to or take things out you detest but it will be beneficial for your mama body and for your babes delicious milky meals. Frozen fruit - I use a great organic daybreak blend from Costco or sometimes I'll just use a frozen banana on hand... fill the remaining portion of your blender container with your fruit to top it off. I use a VitaMix blender and will fill it usually in the order listed above. After blending until smooth, I will pour myself a pint-sized cup and save the remaining smoothie in the refrigerator and use this throughout the day as my snacks or part of my meals. It is nutrient-dense, tastes great and most importantly super easy to access and drink throughout the day when I'm trying to do everything else motherhood demands. On top of my smoothie I take a prenatal vitamin, fenugreek capsules and alfalfa tablets to also boost my milk supply and give my body some added nutrients. Let me know if you have any other questions and I hope you enjoy! Merry Christmas week! I'm so proud of all of you who have made it thus far! Between busy schedules, work, kids, sickness and holiday hustle and bustle there are plenty of reasons to quit. But not us! We will have Christmas Day off this week so push through and make it happen. It'll feel so good and you'll be able to enjoy all the holiday festivities even more knowing you worked your tail off! Remember, watch the videos on the Preggercise Facebook page for the exercises to make sure you are doing them correctly. Also, remember to go to the Preggercise Facebook page each day to find the inspirational quote of the day and that is where you can submit your comment when you've finished your workout. This will qualify you for the prize at the end of the 6 weeks and a great tool for accountability. Lastly, to print the workouts for the week, click here. Work hard. Stay consistent. Keep each other accountable. Let's do this! Jumping exercises are not for you -- stick with the 15 minute power walk. Jumping exercises are not for you --- stick with the 15 min power walk. We are less than 2 weeks out from Christmas and you ladies have made it thus far! Congratulations on making this a priority and making a commitment to a healthier lifestyle for you and your family. You am forming habits by continuing to participate in this 6-week challenge which means even after the New Year, you will still have the urge to workout and you have proven that you have the time! Keep up the hard work. Don't let up. Only 3 weeks left. Go. Jumping exercises are not for you -- stick with the 15 minute power walk. GO.